The last bike show I went to in NYC was in 2003 when Montauk ride guru, Glen Goldstein was throwing them in the Armory on Lexington ave. He wanted to diversify the show from just being a bunch of brand name outfitters showing off their latest wears to something more social and embrace the outlaw NYC culture that was blossoming at the time. The last one he threw had a group ride (dare we say critical mass-don’t-ask-for permission style) mutant bikes and a DJ accompanied ride-your-bike-in-a-circle dance party, yes indoors. Glen was rewarded with his outreach by that one being the last show. They’re may have been other factors involved and definite room for improvement, but the thought to have bike show was a good idea and perhaps ahead of it’s time. It was definitely a reflection of where the biking community was at. 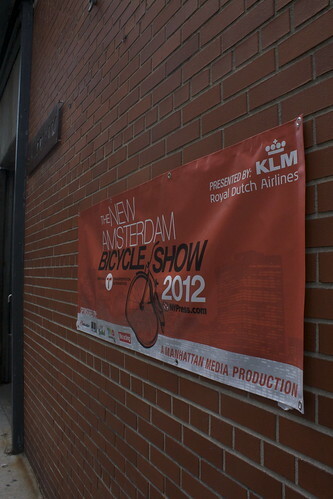 a ton of bicycle stuff, a fashion show and guest speakers. 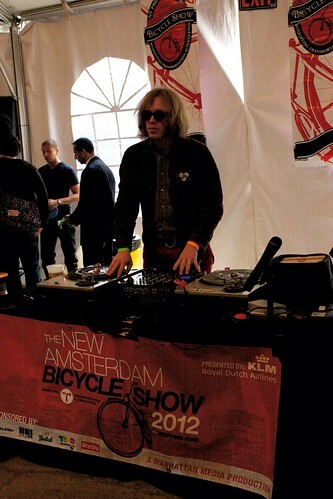 It was held in the one level event space, west of Soho called the Skylight Soho. I attended the event with the wife and three year old who despite the short attention span, enjoyed seeing everything and getting free stuff…what’s a trade show without schwag…right?